REVIEW: Holiday Dial Foaming Hand Wash! I received some Holiday Dial foaming hand soap to try out. Not only does it do the job to get my family's hands clean, but it comes out a foamy pick color! I like it...seems more festive :) The Holiday collection features four designs: Santa, Snowman, Candy Cane and a Holiday scene. Each are meant to brighten up your sink for the season. 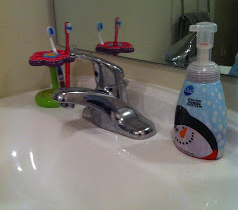 I have the candy cane design in my upstairs bathroom and the snowman one in the kids bathroom. They of course love it and occasionally sing "Frosty the Snowman" as they wash their little hands. 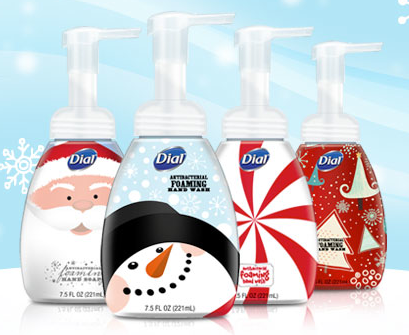 These holiday bottles contain Dial's #1 doctor recommended antibacterial foaming hand wash. It kills 99.99% of germs and is still gentle on the skin. Be sure to Like Dial on Facebook to be informed about new products, coupons, and promotions! Dial provided a free sample of their Holiday Foaming Hand Soap for this post. My participations is voluntary and my opinions are always my own.